This abstract was presented today at the 2014 Association for Research in Vision and Opthalmology (ARVO) meetings in Orlando, Florida by Junhuang Zou, Tihua Zheng and Jun Yang. Purpose: PDZD7 is a newly identified modifier and contributor gene of Usher syndrome (USH). In the inner ear, PDZD7 colocalizes with GPR98, an USH2C protein, at ankle links in cochlear and vestibular hair cells. Therefore, PDZD7 is proposed to be a novel component of the USH2 complex, which is composed of the three known USH2 causative proteins. In this study, we investigated PDZD7 expression and its role in the organization of the USH2 complex in the retina. Methods: The expression of Pdzd7 was examined at the mRNA and protein levels using RT-PCR, western blotting, and immunostaining assays. A Pdzd7 knockout mouse was generated by gene trapping and characterized phenotypically by immunostaining and electroretinogram. Results: Five Pdzd7 splice variants were identified from 19 independent RT-PCR clones in adult mouse retinas. All of them are predicted as N-terminal but not full-length Pdzd7 isoforms. At the protein level, full-length Pdzd7 was found in the mouse retina during postnatal development. However, no Pdzd7 protein expression could be detected in adulthood by either western blotting or immunostaining. Pdzd7 knockout mice showed close to normal distribution of USH2A, GPR98 and WHRN at the periciliary membrane complex in photoreceptors. The knockout mice exhibited normal ERG responses at one month of age. Conclusions: Despite the existence of multiple splice variants, PDZD7 expression at the protein level is very low in the retina. 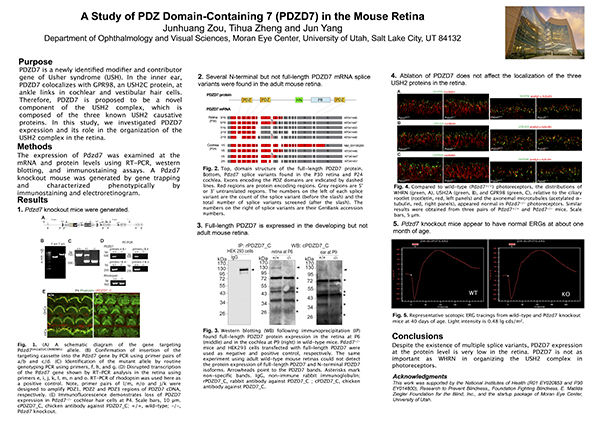 PDZD7 is not as important as WHRN in organizing the USH2 complex in photoreceptors.